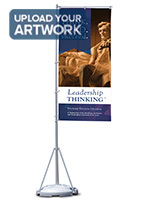 This Flag Banner for Business is an Innovative Promotional Solution for Outdoor Environments! Custom Feather Signs and Towering Flagpoles Make for Prominent Advertising Presentations! 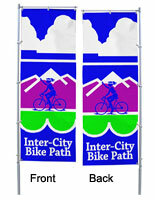 Purchase Your Flag Banner Today and Customize It with a Company Logo! 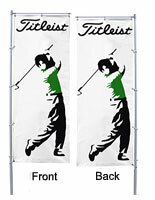 This flag banner combines the best of both worlds. The four color silk screened flag banner with continuous colors is available at lower costs than digitally printed options. The flag banner is actually two feather signs sewn back to back, so text reads properly on both sides. 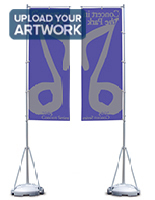 Our company has partnered with one of the world's premier outdoor fabric flag banner silkscreen printers based in Europe. 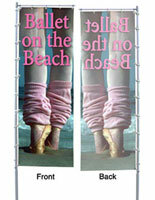 The flag banner undergoes a specialized four color silk screen process that allows us to render full color images. 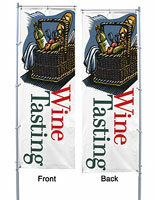 Each flag banner is manufactured from white knitted polyester with hemmed seams. 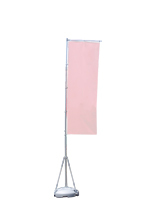 The hemmed seams prevent fraying of the flag banner over time. In addition, white edge reinforcement is sewn onto one side and the top of the flag banner to keep the grommets from tearing out.